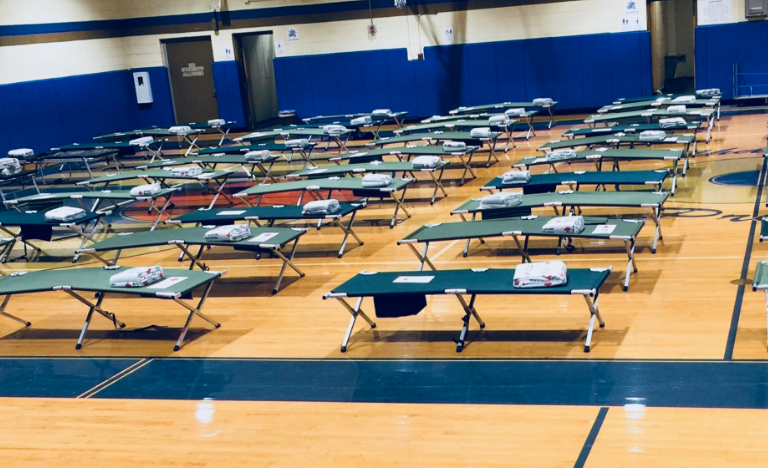 Orange County emergency officials said that 156 residents spent Thursday night in the two emergency shelters opened ahead of the impending impact of Hurricane Florence. The massive storm began battering the coast of North Carolina on Thursday before making landfall Friday morning. Orange County and the surrounding area was hit with the first outer band of heavy rain and wind associated with Florence early Friday morning, which knocked power out in some areas. Four additional individuals arrived at the shelter at Smith Middle School in Chapel Hill on Friday morning, according to Orange County officials, bringing the total at the Smith Middle shelter to 115; there are 45 individuals at the CW Stanford Middle School shelter in Hillsborough. Capacity at the two shelters “is not set in stone,” officials said Friday. The capacity depends on the available cots, blankets, staff, food and other resources. While neither shelter is full as of 9 a.m. Friday, officials said evacuees may be redirected to Stanford Middle if Smith Middle does hit capacity. Anyone who is in need of a ride to a shelter on Friday morning can contact Orange Public Transportation at (919) 245-2008 to request service to a shelter. Transit vehicles will operate until 5 p.m. Friday, unless weather conditions force them to stop earlier in the day. More information on the established shelters and what items are needed to wait out the storm is available here.